How do scaffolding proteins regulate the stability of cell-cell adhesions? Scaffolding proteins are known to regulate the stability of adhesion complexes through their physical interactions with the core components. In some cases however they may also recruit additional regulatory proteins to the adhesion site. These proteins are often identified as binding partners to one or more of the key components of AJs such as E-cadherin, α-catenin and p120-catenin. In some cases scaffolding proteins, such as cortactin (link to GT), may recruit regulators of actin filament dynamics like the Arp2/3 complex or N-WASP, which will regulate the function of the adhesion complex as described above. In other cases they will stabilize the core components and regulate their function. One adaptor protein that is crucial to the stabilization of the AJ complex is p120-catenin. This protein prevents the endocytosis of the classical cadherins in a function that was recently attributed to its binding at the juxtamembrane position of the cytoplasmic tail of cadherin . Three VE-cadherin residues in particular, (DEE 646-648), which are well conserved across the classical cadherins and lie in the p120-catenin binding site, were identified as producing an endocytic signal that is blocked upon binding of p120-catenin. Mutations within this motif not only impeded p120-catenin binding but also prevented endocytosis of cadherin . Similar findings have shown that binding of the small GTPase RAP1 to afadin enhances p120-catenin binding to E-cadherin, preventing endocytosis of E-cadherin and stabilizing the E-cadherein–nectin complex . What is the role of Ran GTPase in nucleocytoplasmic transport of RNA and proteins? The chief function of Ran GTPase is the regulation of nucleocytoplasmic transport of RNA and proteins through the nuclear pore complex. While molecules smaller than 40kDa are able to diffuse freely across the nuclear membrane, larger molecules and mRNA require carrier proteins named karyopherins to facilitate energy dependent nucleocytoplasmic transport. Read More..
How is the cytoskeleton linked to adherens junctions? Early biochemical studies exploring the structural link between the cytoskeleton and cadherins in adherens junctions (AJs) concluded that it comprised direct interactions in the following order; cadherin tails bind β-catenin, β-catenin binds the VH1 domain of α-catenin , the VH3 domain of α-catenin binds actin. Read more..
NF-κB (nuclear factor kappa light chain enhancer of activated B cells) is a family of highly conserved transcription factors that regulate many important cellular behaviours, in particular, inflammatory responses, cellular growth and apoptosis. NF-κB is also involved in diseases such as cancer, arthritis and asthma. Read more..
What is Hippo signaling pathway? The Hippo signaling pathway is a complex network of proteins that controls organ size via regulation of cellular proliferation, survival and differentiation. Initially discovered by genetic mosaic screens in Drosophila, the core of the Hippo pathway is comprised of two highly conserved kinases centering on the mammalian effector proteins Yes-associated protein (YAP) and its paralogue Transcriptional co-activator with PDZ-binding motif (TAZ, also known as WWTR1). Read more..
How does the Wnt signaling pathway play a role in cardiac development? Intracellular signaling cascades mediated by the Wnt family of secreted signaling proteins play an essential role in regulating a number of cellular functions, such as proliferation, differentiation, adhesion, survival, apoptosis, and so on. Of their myriad signaling functions, Wnt ligands have been extensively researched for their regulatory effects on early cardiogenic events, during which the linear heart tube is transformed into a multi-chambered heart structure. Read more..
What is canonical Wnt receptor signaling pathway? The canonical Wnt receptor signaling pathway is a series of molecular events that are initiated by the binding of Wnt proteins to the frizzled family of receptors on the cell surface. This ultimately activates transcription factors and results in changes to the expression of target genes. Read more..
How is SRF signaling activated? The activation of the SRF transcription factors are regulated by proteins such as myocardin and ternary complex factors (TCF) and cofactors such as GATA and CRP family proteins. Read more..
What is serum response factor and what are its biological roles? Serum response factor (SRF) is a transcription factor that plays a key role in the transduction of mechanical signals from cytoplasmic actin and the extracellular environment, to the cell nucleus. It is highly conserved from yeast to humans and plays a role in a large number of mechanotransduction pathways. Read more..
How are mechanical signals from the extracellular surroundings relayed to the nucleus? Cells are capable of relaying mechanical stimuli from their physical environment all the way down to the nucleus through electrochemical, biochemical or mechanical pathways. Read more..
What are the different types of cellular signaling pathways? Cells not only interact with their immediate microenvironment, but may also detect and respond to signals originating much further away. Based on the source of signaling molecule or ligand, signaling pathways are classified into endocrine, paracrine, juxtacrine and autocrine signaling. Read more..
What are the key components in cell signaling? There are many components that facilitate cell signaling. Some of these protein components may serve as receptors, whereas others may act as intracellular messengers, sensors or effectors. Read more..
How do the ephrin family of proteins function as guidance signals? Ephrins are contact-dependent guidance cues that induce both attractive and repulsive signals. These signals are transduced via ephrin binding to Eph receptors that belong to the receptor tyrosine kinase family. Read more..
How do collapsin/semaphorin function as repulsive cues for causing growth cone collapse in neurons? Collapsin, which induces filopodia collapse in chick, and its mammalian orthologue, semaphorin III (SemaIII) are a few of the most extensively studied proteins that cause repulsion or collapse of growth cones in particular neuronal classes. Read more..
How do neutrotrophins function as guidance cues for inducing growth cone movement? Neurotrophins are secreted guidance cues which stimulates filopodia formation in growth cones. Read more..
How is cell movement controlled by guidance cues? It is not always clear whether a guidance signal provides information for both directional and temporal movement. However, they can be integrated temporally and/or spatially. Read more..
What are guidance cues and how do they regulate important physiological functions? During neural development, highly motile structures on the developing neurites, called growth cones, are guided by signals from the extracellular envrionment. Guidance cues come in many different forms, from diffusible extracellular proteins and lipid factors, to extracellular matrix proteins and/or carbohydrates located on the cell substrate. They may also originate from membrane of adjacent cells. Read more.. Upon alteration in the transmembrane and their proximal domains, the bent headpiece extends in less than 1 second with intermediate affinity for ligands. Two models- “switchblade” and “deadbolt”- have been proposed for the mechanism of transmission of signals from across the plasma membrane leading to extension. Read more..
How is integrin activation regulated? Several classes of proteins/events are known to enhance or inhibit integrin activation in various contexts. Read more..
Integrin activation is an important mechanism through which cells regulate integrin function by manipulating the ligand affinity of integrins spatially and temporally. Read more..
How does integrin clustering affect integrin signalling? Clustering occurs by integrin diffusion, multivalent ligand binding leading to transmembrane homodimerization or inside-out signals. Read more..
Integrins are proteins that function mechanically, by attaching the cell cytoskeleton to the extracellular matrix (ECM), and biochemically, by sensing whether adhesion has occurred. The integrin family of proteins consists of alpha and beta subtypes, which form transmembrane heterodimers. Integrins function as adhesion receptors for extracellular ligands and transduce biochemical signals into the cell, through downstream effector proteins. Read more..
What steps are involved in the formation and growth of focal adhesions? The assembly of focal adhesions is highly regulated, with protein recruitment occurring in a sequential manner , and resulting in structures that are organized in specific layers that corresponding to the following functions: receptor-matrix binding, linkage to actin-cytoskeleton and force transduction, intracellular signal transduction, and actin polymerization and regulation. Read more..
How do nascent adhesions grow into mature focal adhesions? Nascent adhesions undergo a transient phase of rapid assembly and disassembly through which a fraction of adhesions survive to evolve into more stable and larger focal adhesions. Typically adhesions during this time vary in size between 0.5 to 1µm, with an average lifetime of ~80 s. They are largely found at the boundary between the lamellum and lamellipodial ruffles. Read more..
Zyxin is enriched along actin filaments, stress fiber bundles, and at cell-cell or cell-matrix adhesion sites. Zyxin is specifically found in more mature adhesions and its absence in early adhesions is commonly used to distinguish the ‘age’ of an adhesion. Read more..
Vinculin is a protein that couples, transmits, transduces, and regulates mechanical force between the cytoskeleton and adhesion receptors.Vinculin frequently links adhesion receptors (e.g. integrins) to the contractile actin-myosin cytoskeleton by binding either talin through its amino-terminal globular head domain, or paxillin through its rod-like tail domain. Read more..
How are Rho GTPases regulated during focal adhesion assembly and dynamics? At the leading edge, focal adhesion dynamics are regulated by localized signaling occuring through alternating activation cycles of Rac1 (lamellipodium), Cdc42 (filopodium), and RhoA GTPases. Read more..
How does cooperative signaling by integrin and syndecan receptors aid in the initiation of focal adhesion assembly? Neither syndecan nor integrin is capable of independently supporting cell adhesion or spreading. Despite the cooperativity of integrin-syndecan pairs in various contexts, recent studies have established synergistic signaling by integrin β1 and syndecan-4. Read more..
How does integrin clustering activate signaling events during focal adhesion formation? Local clustering of ligand-bound integrins, irrespective of global density of integrins, is paramount to efficient signal transduction following integrin-ligand binding.The minimum cluster area required for stable FA assembly and force transmission has a dynamic nanolimit, regulated by the interplay between adhesive force, cytoskeletal tension and the structural linkage that transmits them. Read more..
How is focal adhesion assembly initiated? Focal adhesion formation is initiated upon the binding of adhesion receptors to extracellular matrix (ECM) ligands (e.g. fibronectin, vitronectin, collagen) along the cell periphery usually at the protruding edge of a cell. Both intracellular and extracellular factors can influence the level of matrix binding, in terms of affinity (the strength of interactions) and avidity (the number of interactions, such as lateral interactions between independently activated proteins within a focal adhesion). Read more..
Tensin is a cytoskeleton scaffolding protein that was named for its ability to form a bridge that maintains tension between the actin filaments and cell-matrix adhesion sites. Read more..
Talin contains a 47-kDa N-terminal head, a neck and a 220kDa rod domain. The head domain comprises four subdomains termed F0, F1, F2 and F3, with the latter three forming a three-lobed FERM domain. Integrin tail binding occurs via the F3 phosphotyrosine binding (PTB) domain via a unique interaction with the integrin membrane proximal region, which is sufficient for integrin activation. Read more.. The parvins are a family of actin binding proteins (known as α-, β- and γ-parvin in mammals) that are members of the actin linking functional module at cell-matrix adhesion sites. Read more..
What is the composition of mature focal adhesions? Mature FAs vary in size between 1 to 5 µm and to date, more than 80 types of proteins (~150 proteins) have been located in the FA plaque although not all interactions have been proven in vivo. Several key components are shown to be organized into functional layers covering a distance of approximately 40 nm between the ECM-bound integrins and the actin cytoskeleton. Read more..
What factors trigger the maturation of focal adhesions from nascent focal complexes? Adhesions that manage to grow beyond the transient phase further undergo qualitative changes in a phase described as maturation. This transformation of adhesion sites into stress-fiber bound focal adhesions (FAs) is believed to result from the collective effects of Rho GTPase activity, increased tyrosine kinase activity, change in composition and dynamics, actin crosslinking by α-actinin and tension-dependent actomyosin contractility – all of which take place during local contraction of the lamellipodium. Read more..
What factors trigger the disassembly of focal adhesions? Disassembly is critical during cell spreading and forward movement to allow FAs to extend outwards towards the cell periphery. Disassembly of adhesions can take place as a result of retraction at the rear of the cell after adhesion maturation or at the base of protrusions during turnover. It is primarily mediated through tyrosine phosphorylation events and changes in cytoskeletal tension, which are controlled by regulators such as calpain and microtubules. Read more..
What factors regulate the sequential recruitment of proteins to focal adhesion sites? The chronological order of protein recruitment into focal adhesions leads to the concept of sequential assembly. Accordingly, the exact composition of each elongating adhesions is dependent on their age. The dynamics of component recruitment within individual adhesions has been shown to depend on the rate of lamellipodial protrusion within a given area. Read more..
What factors are responsible for regulating focal adhesion assembly and maturation? The number and distribution of growing adhesions in the cell varies with substrate stiffness, (Extra cellular matrix) ECM chemistry, topography and growth conditions. These determine the force experienced by the adhesions and hence their molecular dynamics leading to mechanotransduction. Read more..
How is the turnover of focal adhesion components regulated temporally? In migrating cells, turnover of adhesion components happens throughout the adhesion life cycle, with a shift in equilibrium between rates of recruitment and removal during the various stages. At the end of each step, the structure undergoes a steady state (quasi-equilibrium) for a specific length of time before it moves on to the next stage. Read more..
What are focal adhesions and how do they function as mechanosensors? Focal adhesions are integrin-containing, multi-protein structures that form mechanical links between intracellular actin bundles and the extracellular matrix or substrate in many cell types. They are commonly found at the ventral surface of cells in 2-dimensional tissue culture and can be envisioned as the feet of the cell, which function as interactive information interfaces between cells and their environment. Read more..
Interaction between cell-matrix receptors and their respective ligands are often the initial step in the formation of a cell-matrix adhesion. Several types of cell-matrix receptors have been identified, each interacting with a specific type of ligand. Read more..
Cell-matrix adhesions are multi-protein adhesion structures that facilitate the interaction of a cell with its extracellular matrix. These are mediated by adhesion receptors and lead to the formation of cell-matrix adhesion complexes (CMACs) that interact with the actin cytoskeleton at the cell interior. Read more..
What is extracellular matrix (ECM)? The ECM is a network of extracellular molecules which are secreted locally to ensure cell and tissue cohesion. The ECM also serves as a reservoir for extracellular signaling molecules that control cell growth, migration, and differentiation. Read more..
What are tricellular tight junctions and how are they assembled? Tight junctions are organized into specialized structures at tricellular contact sites, where the vertices of three cells meet, and they are referred to as tricellular tight junctions. Seminal studies in the 1970s on the ultrastructure of tricellular tight junctions revealed a model for their organization, which remains unchallenged till date. This model describes tight junctions as long and narrow tubes that lie perpendicular to the plane of the epithelial cell layer. Read more..
What are bicellular tight junctions and how are they assembled? Bicellular tight junctions, found between the lateral membrane surfaces of two adjacent cells, are primarily formed by claudin strands. A model for claudin assembly into tight junction strands has been recently proposed from the crystal structures of mouse claudin-15. Read more..
What are tight junction strands? The basic functional units that form adhesive contacts across cells are the tight junction strands, which are composed of transmembrane proteins such as claudin, occludin and tricellulin. Read more..
How do tight junctions aid in the maintenance of cell polarity? The dense network of tight junction strands along the apical region acts a fence to prevent the mixing up of components between the apical and basolateral surfaces. This is essential for the structural and functional differentiation of the two domains and ultimately leads to cell polarity. Read more..
How does the barrier function of tight junctions regulate paracellular ion transport? The barrier function of tight junctions plays a vital role in maintaining the homeostasis within various organ systems. In some cases tight junctions provide a selectively permeable intercellular space. This is found for example in the digestive tract or kidneys, where the intestines and nephrons possess segment-specific permeability within the tubular epithelia that allows for the absorption of nutrients, or clearance of waste respectively. Read more..
How do the functional properties of tight junctions differ based on the claudin types expressed? The physiological properties of tight junctions depend upon the claudin types expressed. Some claudins are classified as barrier builders, while others are classified as pore formers. Read more..
What is the structural composition of tight junctions? Tight Junctions are predominately formed through interactions between members of the Claudin family of proteins and other transmembrane components such as occludin, tricellulin and junctional adhesion molecules (JAMs). Following the polymerization of claudin strands, the complex is strengthened by a cytoplasmic plaque of scaffolding and adaptor proteins such as the ZO proteins, cingulin, PAR3, PAR6, and MUPP1. Read more.. Tight junctions, also known as Zonula Occludens, are cell-cell adhesion complexes that play a role in the organization of epithelial tissue. By forming a meshwork of membrane contacts around the cell, tight junctions demarcate the apical region from the basolateral region, thereby serving as a physical barrier within the membrane and contributing to the establishment of cell polarity. Read more..
ICAMs (intercellular cell adhesion molecules) are cell adhesion molecules belonging to the immunoglobulin superfamily that are mainly expressed by immune cells and endothelial cells, with some brain-secific forms also known to exist (eg. ICAM-5/TLCN). Read more..
What are Ig superfamily cell adhesion molecules? The Immunoglobulin (Ig) superfamily is a large group of cell adhesion molecules that include the vascular and neural cell adhesion molecules (VCAM and NCAM), the intercellular adhesion molecules (ICAMs) and the nectins and nectin-like (Necl) proteins. Read more..
What are the different types of anchoring junctions? There are four main types of anchoring junctions- adherens junctions, desmosomes, hemidesmosomes, and cell-matrix adhesion complexes. Each type of anchoring junction is involved in a distinct type of adhesion. Read more..
Anchoring junctions are protein complexes that mediate the adhesion of cells to other cells or to the extracellular matrix.These multiprotein complexes are found in all cell types where they they stabilize the cells position, provide stability and rigidity, and support tissue integrity by holding cell sheets together. Read more..
What compositional differences exist between adherens junction and desmosomal complexes? While the classical cadherins in adherens junctions (AJs) are bound to catenins such as β-catenin and p120 catenin which subsequently bind to the F-actin cytoskeletal network, desmosomal cadherins, bind to distinct cytoplasmic proteins such as plakoglobin (also known as γ-catenin) which in turn link to intermediate filaments. Read more..
What is the composition of the cytoplasmic plaque of adherens junctions? All cell-cell adhesion complexes are composed of intercellular and cytoplasmic components. 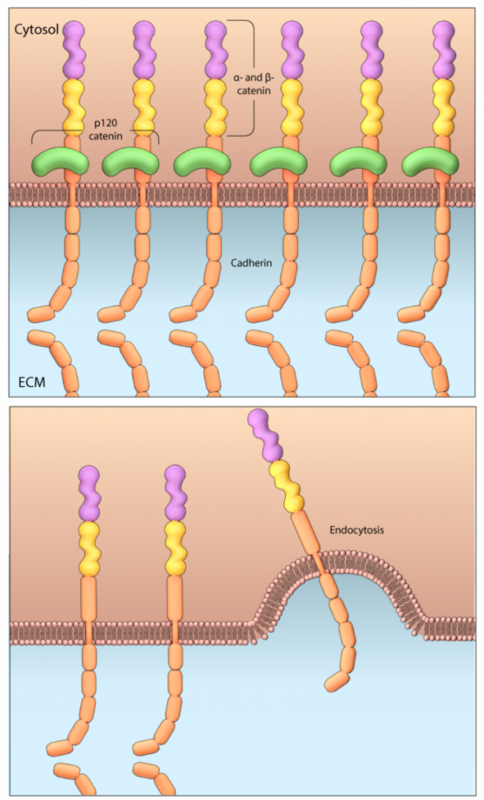 Intercellular interactions are generally facilitated by cell-adhesion molecules (CAMs) such as cadherin or nectin, often in a calcium-dependent process. The complexity of the cytoplasmic region on the other hand has yet to be fully defined. This region, which has been visualized as a dense plaque of proteins that contains a vast array of structural and scaffolding proteins as well as regulatory proteins. Read more..
How do transient linkages mediated by adaptor proteins lead to the stabilization and maturation of adhrens junctions? It is unlikely that any single protein is responsible for linking the catenin-cadherin complex with the actin cytoskeleton. Instead, eplin and vinculin, as well as additional candidate proteins such as ZO-1, α-actinin, afadin are likely to contribute in a manner that is cell type dependent. Read more..
What is the role of EPLIN in the stabilization and maturation of adherens junctions? Recruitment of EPLIN, which is not expressed in all cell types but is found exclusively in AJ, has been shown to be tension dependent. In this case EPLIN binds to the sides of F-actin where it stabilizes and/or crosslinks bundles of actin filaments to prevent Arp2/3 binding and subsequently, filament branching. Read more..
How are various adaptor proteins recruited to the cytoplasmic plaque of adherens junctions? The difficulties in establishing a direct link between the α-catenin–β-catenin complex and the actin cytoskeleton underlies a higher degree of complexity in the intracellular structure of AJs. Much of this complexity stems from the multiple interactions that each component can engage. Read more..
How is adherens junction formation initiated by the fork initiation and zipper model? The establishment of initial contacts at adhesion sites occurs cia nectin-nectin cis interactions that enable the formation of nectin-nectin trans interactions on apposing cells. 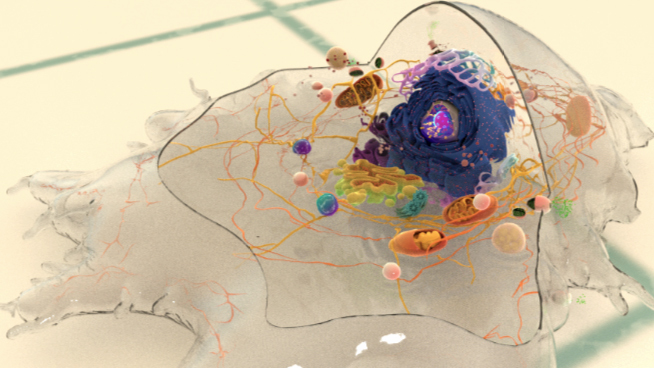 These interactions, being uncooperative and short-lived in nature, are suited to the exploratory cell behavior initiated between cells coming into close contact. Read more..
What is the physiological function of non-junctional cadherin clusters? In addition to the well-established role of classical cadherins in mediating intercellular adhesions, recent research has also revealed the existence of distinct cadherin clusters outside of these adhesions. The physiological significance of such non-junctional cadherin clusters was elucidated in a recent study that analyzed the organization and functions of HMR-1, the C.elegans homolog of cadherins, within its single-celled zygote that is devoid of any intercellular junctions. Read more..
What is the role of cadherin interactions in initiating adherens junction assembly? Most cadherins adhere by homophilic interactions (i.e. they bind to the same type of cadherin) but certain types (e.g. E-cadherin) also adhere by heterophilic interactions (i.e. they bind other types of cadherin). Cadherin association is sensitive to extracellular calcium (hence their name, calcium adhering).Classical cadherins also interact directly with p120ctn at their transmembrane region and through their cytoplasmic tails to beta (β)-catenin or plakoglobin(i.e. gamma [γ]-catenin). Read more.. The cadherin protein family are common cell-adhesion molecules (CAMs) that mediate cell-cell contacts at anchoring junctions (e.g. adherens junctions, desmosomes) and at prominent sites of cell-cell communication (e.g. neuronal synapses). The cadherin protein family are common cell-adhesion molecules (CAMs) that mediate cell-cell contacts at anchoring junctions (e.g. adherens junctions, desmosomes) and at prominent sites of cell-cell communication (e.g. neuronal synapses). Read more..
What is cell-cell signaling and how is it facilitated? Cell-cell signaling refers to inter-cellular communication through the transduction of chemical, mechanical or electrical signals, facilitated by the formation of specialized cell-cell adhesion junctions. There are three main types of cell-cell adhesive junctions in mammals that detect and transduce signals from neighbouring cells: tight junctions, adherens junctions and desmosomes. Read more..
How is crosstalk between the Rho GTPase family members important during cellular functions? Although Rho, Rac and Cdc42 have distinct functions in cell migration and cellular wound repair, cross-talk between the Rho GTPases and the cytoskeleton is critical for these processes. For example, during wound healing, Rho is required for myosin II activation, Rho and Cdc42 for actomyosin ring stabilization and Rac for actin mobilization towards the wound. Read more.. Which are the regulators and effectors of Rho GTPases? A large number of upstream regulators, categorized as GTP-ase activating proteins (GAPs), Guanine nucleotide exchange factors (GEFs) and Guanine nucleotide dissociation inhibitors (GDIs), regulate Rho GTPases. Read more.. The Ras homologous (Rho) protein family is a member of the Ras superfamily of small GTPases. They are highly conserved in all eukaryotes studied so far and Rho, Rac and Cdc42 are the most prominent of the 20 members identified. Read more..
What are the physiological functions of Ras GTPases? Given their origin, members of the Ras family are commonly associated with cancer. Ras mutations are often oncogenic and are found in 10-20% of human cancers. However, Ras GTPases have also been implicated in wide variety of mechanobiological processes, based on their ability to act as a signal transduction node. Read more..
How do Ras GTPases mediate signaling pathways? The Ras family of GTPases are the original members of the small GTPase superfamily and are major regulators of cell proliferation, differentiation and survival.The Ras family GTPases were originally discovered during a search for oncogenic retroviruses. Read more..
How is Ran GTPase expression associated with diseases? High, tissue-specific expression of Ran is linked to tumourigenesis and infections. Read more..
What are the physiological functions of the Ran family of GTPases? Aside from nucleocytoplasmic transport, Ran has also been implicated in a variety of other cellular functions, such as the assembly of the nuclear envelope, the assembly of spindle fibers during mitosis, and other cytoplasmic functions post mitosis. Read more..
What is a Ran GTPase? The Ran (Ran-related or Ras-like nuclear) protein is the single member of the Ran subfamily, and the most abundant small GTPase in the cell. Like the other small GTPases, Ran functions as a molecular switch, converting between the active GTP-bound and inactive GDP-bound conformations. Read more..
What is the role of Rab GTPases in actin remodeling? Outside their canonical role in membrane trafficking, the Rabs function in various cellular processes such as proliferation, adhesion, motility and survival. Read more.. Describe the roles of Rab GTPases in exocytic pathways. Rab GTPases such as Rab3 and Rab27, regulate the exocytosis of secretory products stored in cell-specific organelles in the presence of external stimuli. The localization of Rab27 on secretory lysosomes such as melanosomes in melanocytes, lytic granules in cytotoxic T cells and dense granules in platelets is directly linked to its regulation of melanosome transport and lytic granule exocytosis. Read more..
What are the roles of Rab GTPases in endocytic pathways. Some of the Rab isoforms commonly identified in the endocytic pathway are Rab4, Rab5, Rab7 and Rab11; Rab4, Rab5 and Rab11 function in the early endocytic pathway, whereas Rab7 and Rab9 regulate the later stages of endocytosis. Read more.. Which are the regulators and effectors of Rab GTPases? The subcellular localization and activity of the Rab proteins depend on their nucleotide-bound states and the cycling between activated, membrane-linked Rab-GTP and inactive cytosolic Rab-GDP is regulated by a group of GEFs, GAPs and GDIs. Read more.. The Rab proteins constitute the largest family of small GTPases belonging to the Ras superfamily, with approximately 70 members identified in humans. Rab GTPases are the primary regulators of the vesicular trafficking pathways that are responsible for transporting the vast array of cellular cargo across membrane organelles. The Rabs function as molecular switches in regulating the formation, transport, docking, and fusion of transport vesicles during membrane transport. Read more..
What are the physiological functions of the Arf family GTPases? Arfs are primarily involved in the secretory, endocytic and recycling transport pathways. For instance, The Sar1 protein regulates transport of newly synthesized proteins from the endoplasmic reticulum (ER) to the Golgi complex. Sar1 regulates the assembly as well as membrane constriction and scission of COPII coated vesicles from ER. The ARF1 protein functions in retrograde transport from Golgi to the ER through recruitment of COPI coated vesicle proteins. Read more..
ADP-ribosylation factor (Arf) GTPases are a subfamily of the Ras superfamily of small GTPases. Arf proteins perform diverse and critical functions in fundamental cellular processes like membrane trafficking, lipid modification, cytokinesis and cell adhesion. Read more..
What is the small GTPase superfamily comprised of? The superfamily of small GTPases has been divided into five subfamilies based on sequence and function: Ras, Rho, Rab, Ran, and Arf families. Read more.. The small GTPases are a superfamily of enzymes that function as ‘molecular switches’ and are involved in regulating many cellular processes. In terms of mechanobiology, small GTPases are highly important, having been linked to cell growth, differentiation, proliferation, migration, establishment and maintenance of polarity, vesicle transport and cytoskeletal organisation.The superfamily of small GTPases has been divided into five subfamilies based on sequence and function: Ras, Rho, Rab, Ran, and Arf families. Read more..
What are the roles of ephrin-Eph receptor signaling? How do semaphorins cause growth cone collapse? How are guidance cues integrated into the cell’s biochemical pathways? In terms of temporal integration, lamellipodial and filopodial protrusions at the leading edge of migrating cells and neural growth cones are exposed to a number of guidance cues simultaneously and the proper integrated response is necessary for cell/growth cone guidance and maintenance. In terms of spatial integration, cyclic nucleotides can regulate growth cone behaviours by converting repulsive signals into attractive signals through the activation of cyclic guanosine 3′,5′-monophosphate (cGMP) and cyclic adenosine 3′,5′-monophosphate (cAMP) signaling pathways, respectively (reviewed in ). How do repulsive cues affect actin dynamics? How do attractive cues function? How are cell-cell adhesions regulated? How do posttranslational modifications of cell-cell adhesions impact their stability? What is the role of plaque proteins in adherens junction assembly? What is the role of adaptor proteins in the stabilization and function of core AJ components?